1. MOST CLICKED LINK: Candy Kisses Triangle Scarf from Nanas Crafty Home – A lightweight triangular scarf to show off that colorful yarn … FREE crochet pattern! 2. Coastal Indoor Rug from Maria’s Blue Crayon – Freshen up your indoor space with this pretty coastal rug … FREE crochet pattern! 3. Moondoggie Bag from Designs by Diligence – A stylish tote to stitch in your favorite colors … FREE knit pattern! 4. Summer Waves Baby Blanket from The Blue Elephants – A lightweight ripple blanket perfect for a new mom … FREE crochet pattern! 5. 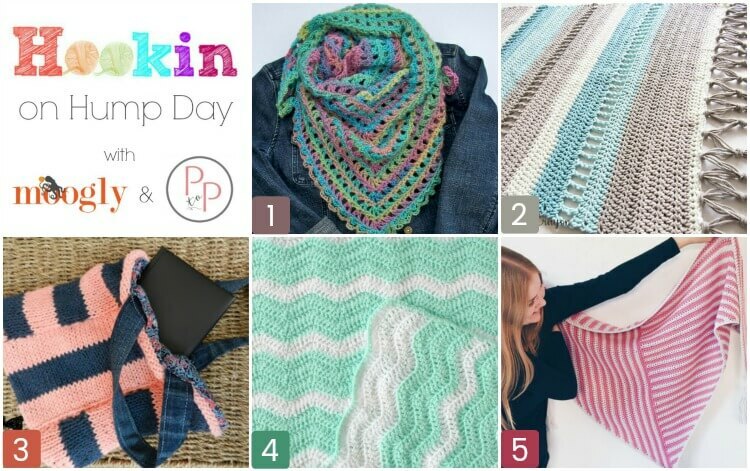 Stripe Me Shawl from Wilmade – A fun and colorful shawl with playful stripes … FREE crochet pattern!